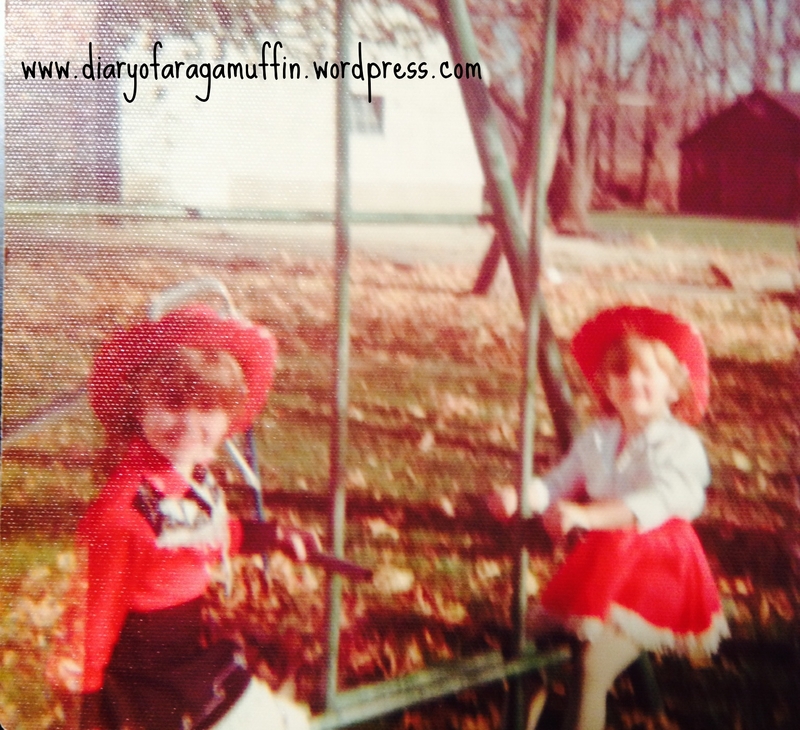 My sister and I on the glider in cowgirl getup. I am on the left, probably about 5 or 6 years old, and if so, Sherry was 3 or 4. Summertime. For me, as a child in the 70s, that meant sunny days free from structured schedules. When I was a little girl, my sister, Sherry, and I were privileged to live on a non-working farm with lots of empty outbuildings, perfect for playing house in or to use as base for a game of tag. Many times though, we would play in our backyard on the best swing set ever! Our swing set wasn’t one of those small, aluminum swing sets with the plastic seats and attached slide. No, ours was made of heavy-duty iron, like what you used to see at school playgrounds and was at least 10 feet tall. It was painted John Deere green and had two red, wooden seats for swings, attached with real metal chains, that would pinch your fingers if you held it wrong. It also had a glider, that we pretended was a horse and to us, it rode just as fast as one. I think I was in 3rd grade before I could reach the crossbar on the end. I absolutely loved that swing set. My sister on our beloved swing set. (Notice the outhouse directly behind her!). Photo by Stacey Heller with her very first 110 camera. Circa 1979? 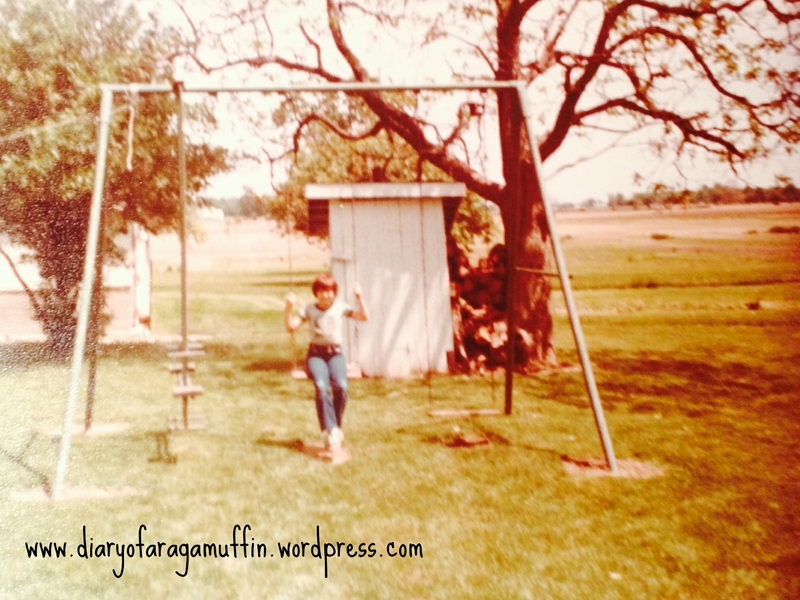 The source of many days of pleasure, that swing set also gave me one day of intense pain. Sherry and I were outside playing one evening. I was hanging upside down, my long hair almost touching the grass, with my knees hooked on the crossbar. As I liked to do, I started swinging back and forth. The glider also was swinging back and forth, and the hollow metal handle made contact with my eye. It felt like my eye had been poked out, and of course, I immediately started crying and holding my left eye. Our babysitter came running over and put her hand on top of mine tightly as she took me inside to call our parents. I had calmed down to several long, heaving sobs, but it was only a few minutes or so before I forced my hand down and saw bright red liquid. To this day, I do not do well at the sight of blood. That moment gave new meaning to the term “blood-curdling scream”. 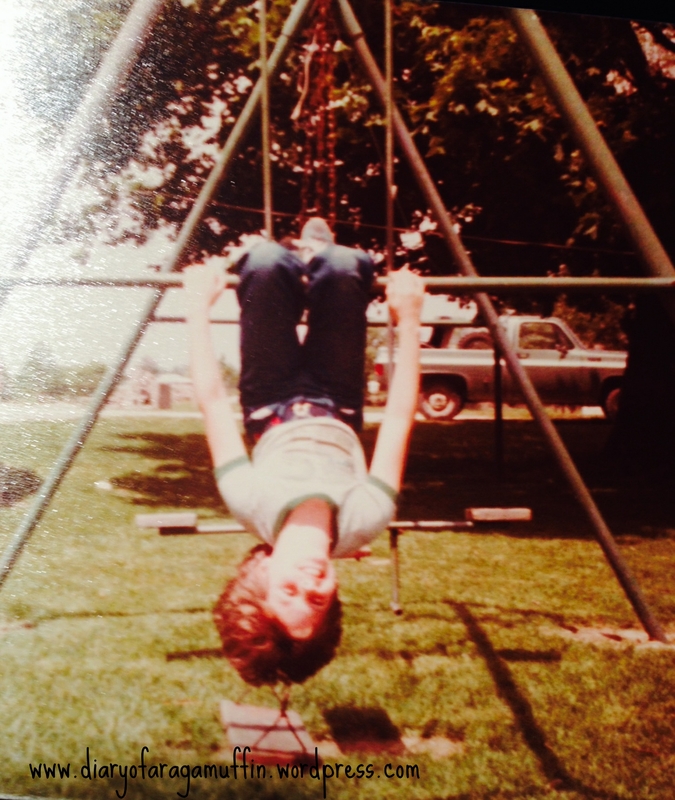 Sherry hanging upside down, just like I was during my injury, except she was on the side with the swings. (She was always the smarter one). One ER visit later and my wound, which conveniently coincided with my left eyebrow, had been stitched up. I remembered that story because I’ve been doing some internet research on wounds. Technically, a wound is an injury caused when the skin is cut or broken. It can happen many different ways, whether from a swing set, a dog bite or a surgeon’s scalpel, but the healing of that wound is done generally the same way. First, the skin creates a scab, a hard covering of dried blood that forms over the wound to cover and protect it as it heals. During the healing process, the body infiltrates a wound with inflammatory cytokines to clean the area of any foreign body or infection. These pro-inflammatory cytokines produce itch. Additionally, a high level of histamine has been found in healing skin and scabs, which we know will create the sensation of itching. During an injury, nerves may have been damaged, creating inappropriate signals that the brain interprets as itch. Scratching that scab as it is trying to heal can cause damage to the new tissue that has grown to replace and repair the damaged tissue. It can slow the healing process and can result in excessive scarring. Additionally, it can cause potentially harmful bacteria on the hands to transfer to the wound, again putting you at a higher risk of developing infection. Finally, scars form when deep, thick layer of skin is damaged. The body forms new collagen fibers (a naturally occurring protein in the body) to mend the damage, resulting in a scar. The new scar tissue will have a different texture and quality than the surrounding tissue. Scars form after a wound is completely healed. Some of us have been hurt by friends. Although the Bible says, “Wounds from a sincere friend are better than many kisses from an enemy.” (Prov. 27:6), it certainly doesn’t hurt any less. Most Christians understand that Jesus can create that healing ‘scab’. Our trouble is that we can’t stop picking at the scab once it starts to form. As I learned in my research, healing WILL cause itching and the desire to scratch, or pick at the scab. I think it’s the same with our mental and spiritual scabs. As they heal, sometimes we get the urge to pick at it perhaps by telling someone else how you were done dirty by so-and-so. Or maybe a friend brings up the past hurt and encourages you to re-hash it. DON’T PICK THE SCAB. Remember what happens? It slows the healing process and could cause infection. If we leave the scab alone, eventually we will have a scar. Scars can be a badge of honor. If we allow them, scars can tell a story of His faithfulness, mercy and grace extended to us. They can teach others that He will never leave us or forsake us. They can show others of a warning in their own life of what NOT to do. Someone once said, “Scars are like tattoos, with better stories.” Spiritual scars can be testimonies of His perfect love and healing power. Let’s not pick the scabs so we can have more scars. Previous Previous post: How can the church get better at mental illness?